Old Coleman Parts Online Store > Categories > Technical Assistance Archive > 2 Coleman adverts. Hello fellow lampers, these adverts may be of interest, Jeff. Those are really cool and colorful! Sure would be nice framed and hanging on the wall! Wow. Those show the first 'instant lighting' lamp and lantern's. Very cool. Thanks for posting Jeff. Hello Ed and Chuck, these adverts may also be of interest, the second advert was sent to me by Bud Michael, Jeff. Those are very cool, do you own them? Post more ads if you got 'em! I love the old graphics. Very Cool.
" Makes and burns its own gas "
Must be noteing liquid to gas through generator ? Those are really cool. The sign I got recently has the same picture of the lamp and lantern as well as the same picture of the guy holding up the lantern. Hello one and all, i'm glad that those adverts are of interest and that's a great sign Mel, Jeff. This 1944 advert may also be of interest, Jeff. Here are some CQ., adverts, Jeff. 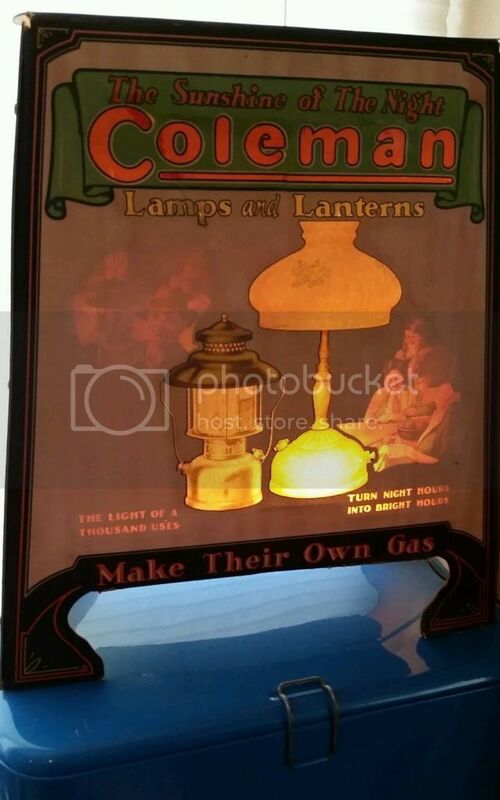 Here are two 1920's Coleman lantern adverts, Jeff. Here is a 1933 Coleman advert, Jeff. Here are two 1945 Coleman adverts, Jeff. "A dime's worth of fuel yields many seconds of light." Anyone have one of the free booklets in the ad, "How To Make 'Em Work Like New" ? Thanks Jim, the 1926 advert is well put together, Jeff. Thanks to all who posted an ad. My fave is old Dr. Freud, reading the Wichita Eagle! Thanks Gary, this 1936 advert may be of interest, Jeff. These two adverts were sent to me by Bud Michael, Jeff. Or possibly the Wichita Beacon; the other Wichita daily newspaper back in those days. Makes and burns its own gas ?? That is absolutely correct. The confusion comes from people using the word "gas" when referring to gasoline. The Coleman generator generates gas by using heat to vaporize a liquid fuel. If you could see what is coming out of the generator (you can on a Petromax) you would see. You hear it hiss but nothing appears to be coming out, but it is a gas, like natural gas, oxygen, nitrogen etc. You can't see anything. The gas is generated (made, converted) from liquid gasoline or kerosene, or whatever you are burning. Really apprciate these ads, so fun to read and gives some great insight to the technogy of the day via the selling points made. Living and working on a farm myself - the farm ads are of great interest. Keep them coming if theres more ! Hello Steve, you are welcome and i shall add more through time, Jeff. The first advert is from 1942 and the second advert is from 1968, Jeff. Here are another three Coleman adverts, Jeff. Here is an advert for Coleman paraffin/kerosene lanterns, Jeff. Here is another 1926 advert, Jeff. Posted in another thread but here is an advertisement/flyer for a Coleman Cooker. Hello Bart, that's a fine advert and perhaps other members will also add to this post through time, Jeff. The first advert is from 1923 and the second advert is from 1926 and the third advert is from 1940, Jeff. Here is another 1940 Coleman advert, Jeff. I assume that this advert dates from about 1920, but perhaps someone else will have a more precise date for it? Jeff. This advert is from 1919, Jeff. If I recall correctly, this photo which dates from about 1926 was sent to me by the late Mr Herb Ebendorf, Jeff. I do not have a precise date for this advert, but i reckon that 1915 would be close, Jeff. The first advert is from 1923, but I do not have a precise date for the second advert, 1928 would be close, Jeff. Here are two British Coleman adverts and the first advert is dated 1923 and the second advert would also be from the 1920's, Jeff. The first advert is from 1925 and the second advert is from 1929, Jeff. This advert is from 1928, Jeff. The first advert is from 1941 and the second advert is from 1945, Jeff. This advert is from 1926, Jeff. The first advert is from 1947 and the second advert is from 1948, Jeff. This advert is from from 1925, Jeff. This advert is from 1929, Jeff. Oh how I wish Santa would bring me one of those stoves, or anything in those ads. New in the box please! Here is an Arc lantern advert and a 1915 Coleman award advert, Jeff.